A sukkah is a temporary hut, or booth, built especially for the week-long Jewish harvest festival of Sukkot. In the Torah, in Leviticus, God commands the Jews to build “booths” and live in them during the festival of Sukkot. This temporary structure is known as a sukkah; it is constructed with three or four walls and a roof known as a “schach” made from natural organic materials. Traditionally, Jewish families decorate the sukkah with a variety of decorations including homemade ornaments, paintings, and streamers. Rabbinic law encourages Jews to live, sleep, and eat in the sukkah for all seven days of the festival, weather permitting. Most modern Jews do not actually sleep in the sukkah (though some do); it is used instead as a special outdoor dwelling place for dining together with family and friends. I thought it would be fun to teach my daughter the meaning of the Sukkot by building a miniature sukkah, one that she could construct herself (with a little guidance from me). 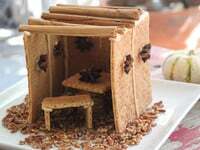 Since we love to snack, and Sukkot is about the bounty of the harvest, I decided to make the sukkah edible. We each made and decorated our own mini sukkah, and we had a lot of fun doing it. Here’s how! 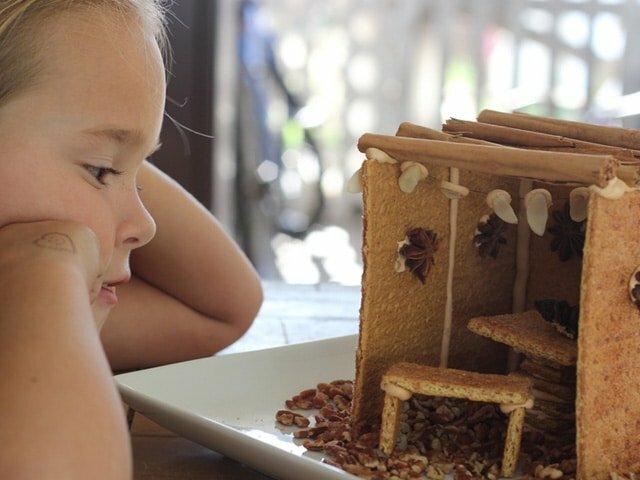 Our sukkahs were constructed with cinnamon graham crackers, but your favorite gingerbread recipe would work just as well. It is all held together with good old fashioned cookie-cement… aka Royal Icing. Royal Icing is actually quite simple to make. It’s sticky and it hardens over time so it’s not something you can make ahead, but if you allow yourself plenty of time and a clean counter space, it’s something that even the busiest mom can pull off. I’ve posted the Royal Icing recipe at the end of this blog (scroll down to the end of the blog to print). You’ll need something called Wilton Meringue Powder; click here to purchase. You should be able to find it at your local craft store, too. It’s kosher certified, not too expensive, and can be used for a variety of crafty food decorating purposes. 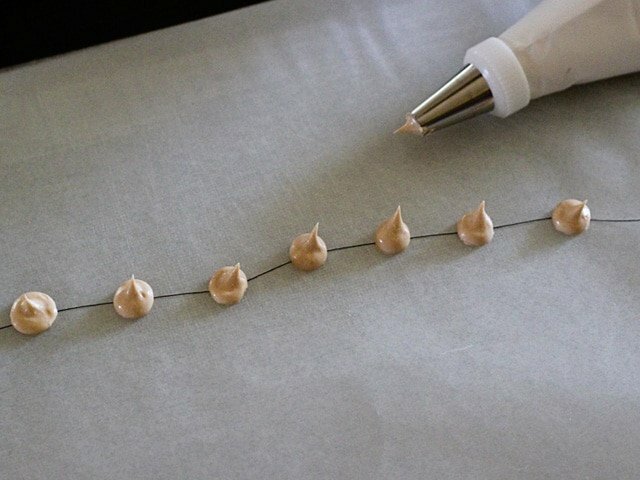 Once you’ve made your Royal Icing, you’ll need to prepare it for piping onto your mini sukkah. My favorite way to pipe icing is with a medium tip, a coupler, and a washable icing bag. But if you are not the type to have cake decorating supplies on hand, a regular ziplock bag will do just fine. Just fill the bag with icing (not too full of course or it will squeeze out and become a nightmare mess), and then cut off one bottom corner (just the very tip!) to create an icing bag. Squeeze the bag gently to push the icing through the corner hole. Here’s a quick tip for filling bags with icing— place the bag in a jar and roll the edges over the jar opening (see picture, above). Spoon the icing in and close it up with a rubber band. This keeps the mess down significantly. Now it’s time to pipe! Just run a bead of icing down the seam of your structure and hold it still for 15 seconds. A glass or a can from the pantry can help you to hold your walls steady until the icing has hardened. Add your roof and you’re nearly done! 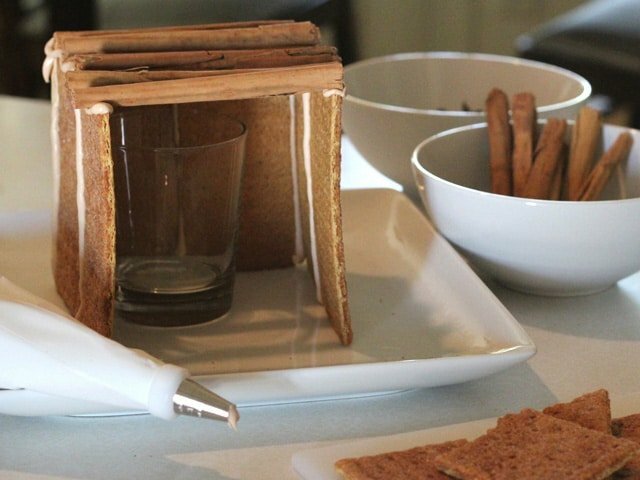 We used cinnamon sticks for the roof of our first mini sukkah– they’re pretty, and they smell great, too. Make sure you leave space between each roof “plank,” so your imaginary ancient Israelites can see the stars through the top of the sukkah! Then while the icing is still soft, gently press your decorations (candy, nuts, spices) onto the icing dots and let them dry completely till they harden. Be sure you give them time to dry. Don’t be like me and nudge and tweak them every five minutes. If you let them sit for an hour or more (give it a full day if you have the time), your garland will stay intact. You can make a table and a bench, like we did, using more Royal Icing and graham crackers. This gave our imaginary ancient Israelites a place to sit and eat. We also added a crushed nut floor to simulate the fields where the Israelites stayed during the harvest. 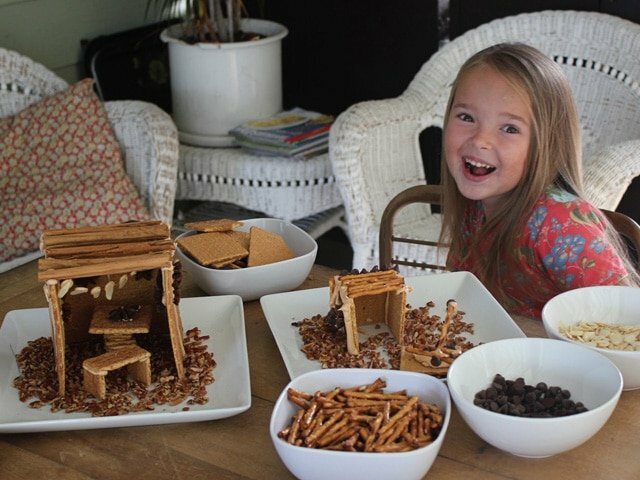 Once we’d created our first mini sukkah, I let my daughter try her hand at creating her own. I was pleasantly surprised at how well she handled the icing. Younger kids might make more of a mess than she did, but that’s part of the fun, too. She had a great time decorating with these delicious ingredients. 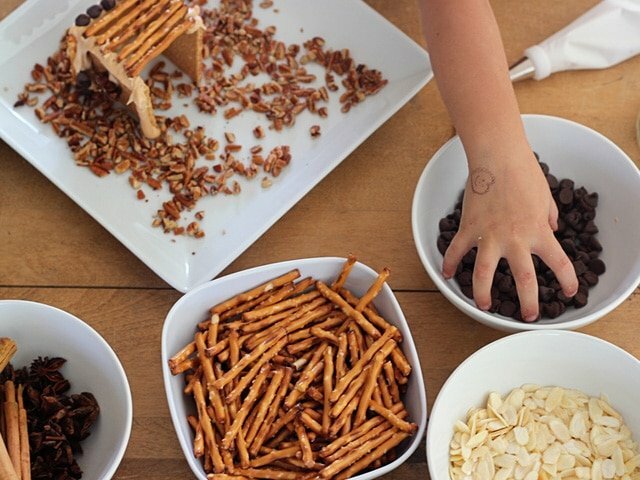 When you use decorations like pretzels and chocolate chips, the whole sukkah becomes edible– so after you enjoy looking at it, you can snack on it, too! This craft is a great way to start a discussion about Sukkot, to learn more about the holiday and why we build a Sukkah. It’s also a wonderful way to spend time together and appreciate the abundance that we have in life. Whether it’s pretzels and chocolate chips or friends and family, Sukkot is a happy time… so rejoice! – Decorations – you can get creative with this. Some ideas: nuts, dried fruits, star anise or other whole spices, candies, sprinkles, chocolate chips, etc. Finally… here’s that Royal Icing recipe I promised you! You’ll need a special ingredient called Meringue Powder. I recommend this brand (click here), which is kosher certified. If you want to color your icing, you’ll need food or icing coloring. Many food colors are not kosher certified– try this brand (click here) if you’re looking for a kosher certified brand. 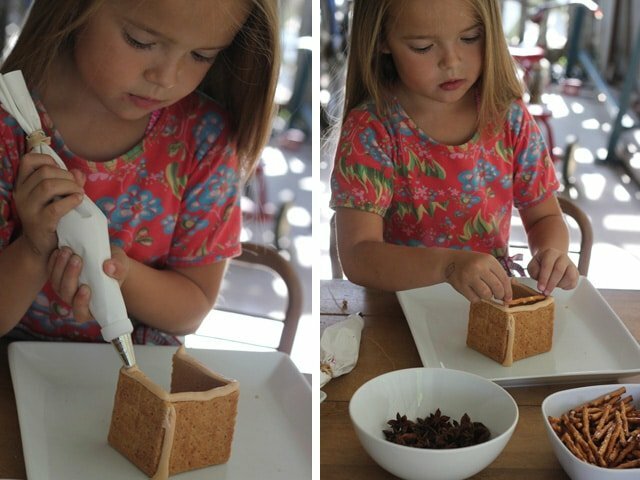 Use this sticky icing to assemble your mini sukkahs! 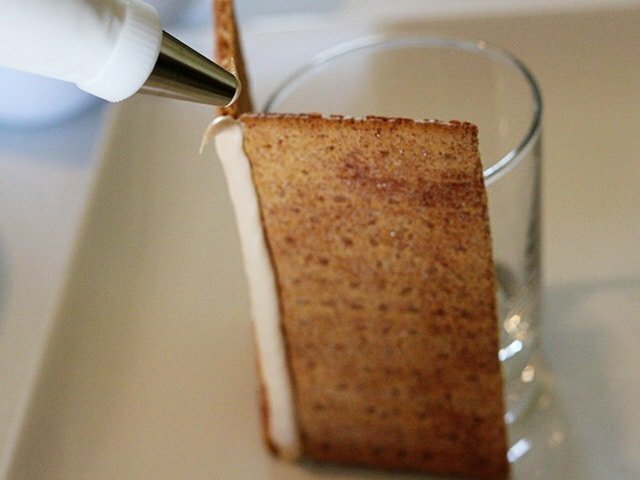 Makes enough royal icing for four fully assembled graham cracker sukkahs for Sukkot. 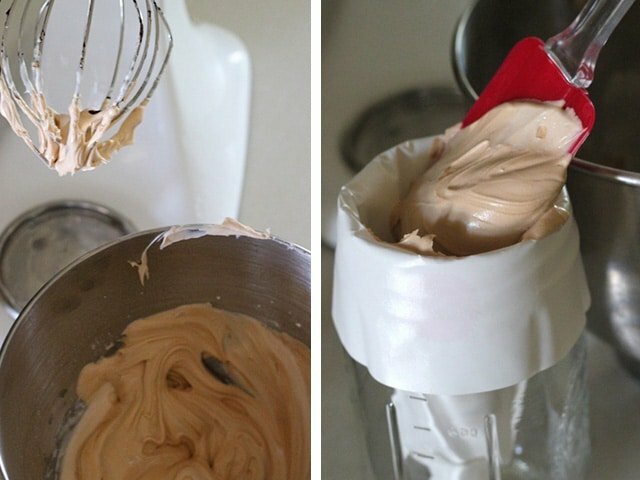 Beat all ingredients until icing forms peaks (7-10 minutes at low speed with a heavy-duty mixer, 10-12 minutes at high speed with a hand-held mixer). Keep all utensils completely grease-free for proper icing consistency. When using a large countertop mixer, or for stiffer icing, use 1 tablespoon less water. I added a few drops of brown food coloring to my icing because I had a color palette in mind. You might like your icing traditional white or maybe even bright and festive. Just add the food coloring while you're mixing and you're good to go! To learn more about the Jewish holiday of Sukkot, click here. For more Sukkot holiday crafts, click here. True teachers teach what they love ❤️ and teach it very well. I don’t t think we need to guess what kind of teacher you are, do we? Fantastic! Such a joy you are!! I am doing this for a five sense project of Sukkot. Can I just buy the royal icing? Hi Amy, Tori’s assistant Ashley here! You can certainly purchase royal icing for this project if you’d prefer. This is a cute project.I am teaching my sons about the holidays.We are Christians and this is a good way to show that Yeshua is our dwelling place.And that God provides all our needs.Praise Yeshua!John 1:14 is a good Scripture to go along with this project. for simchat torah you can make edible torah…with 2 long pretzels and have kosher marshmallows at the ends and wrap fruit wrap as the Torah…. I did this when I taught Sunday school. 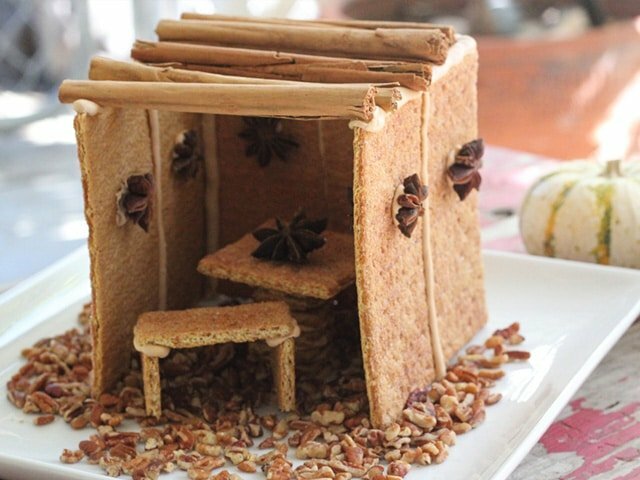 Instead of cinnamon for the roof, we used pretzel sticks. Also, fruit loops and willy wonka candy shaped fruit work as great decorations. Thank you so much for getting back to me. I just called them and the product is Kosher. My students will love this activity. Adorable sukkah. Great idea. Love the star anise decoration. Happy sukkot to you all! What a cool idea. 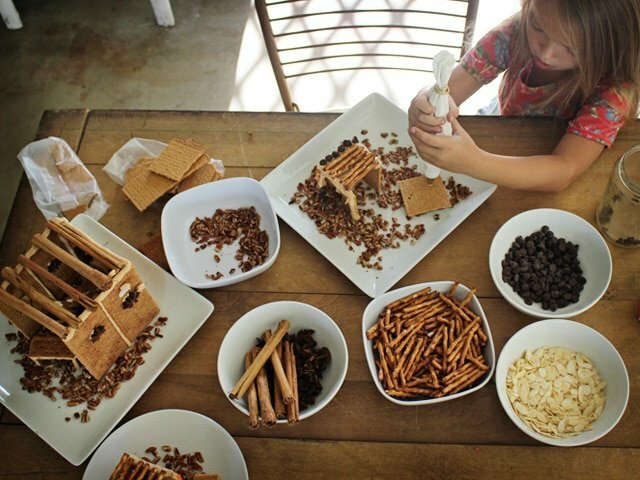 I like this very much that the kids can be creative, get into touch to tradtions and at the same time learn to something in the kitchen. I’ve just discovered your blog, I really like it a lot, so many interesting and amazing posts. Nice tip on filling the piping bag – I shall remember that! What a fun project for kids! I hope you’re having a GREAT time! What a great idea to get the little ones involved! So cute! I LOVE this idea! We will so be doing it next year. Thanks for your comment on my blog today. And I agree … I will be spending much time on your site too (I already have). Aw! what a cute idea… Aw soooo cute! I love it! P.S. I love your mini sukkah! Awwww look at her face…. such a happy child! I love it! this is a wonderful way to recognize my favorite time of year…..I hope your harvest is bountiful! What a great craft idea! I’m feeling guilty that I have done absolutely nothing for Sukkot, but perhaps I’ll get around to a baking project tonight.